See also other antimycotics . 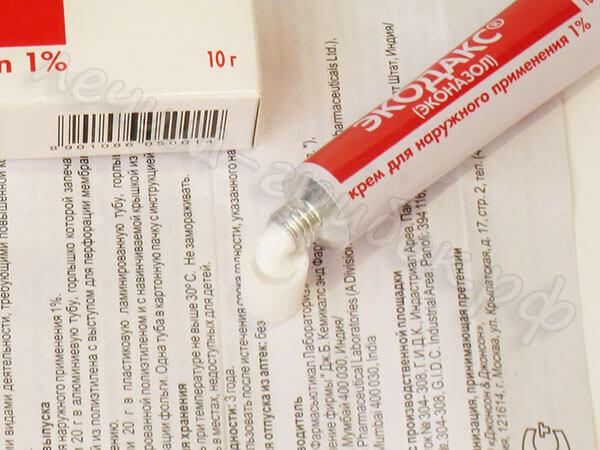 Uniform cream of white or yellowish color, with very weak smell. Available in tubes of 10 and 20 g.
In short, the cream is quite strong (effective), penetrates deep into the skin, is relatively inexpensive, but can cause side effects, see below. Fungal lesions of the skin, including between the fingers, in the inguinal folds, scalp, erythrasma, skin candidiasis, etc. The cream must be rubbed into the skin until completely absorbed. Apply to the affected area 2 times a day. Duration of treatment from 2 to 6 weeks. 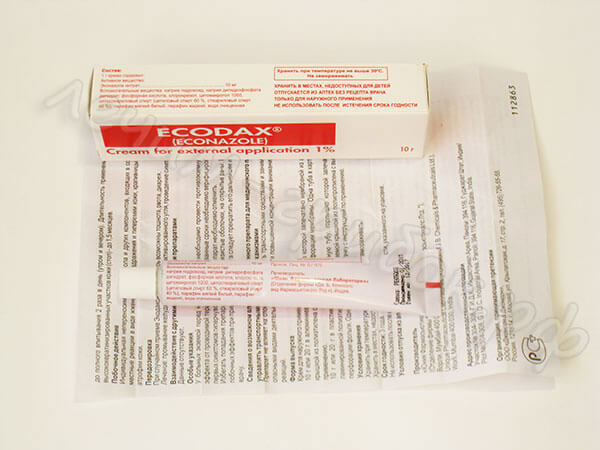 Ecodax is contraindicated during pregnancy and lactation. 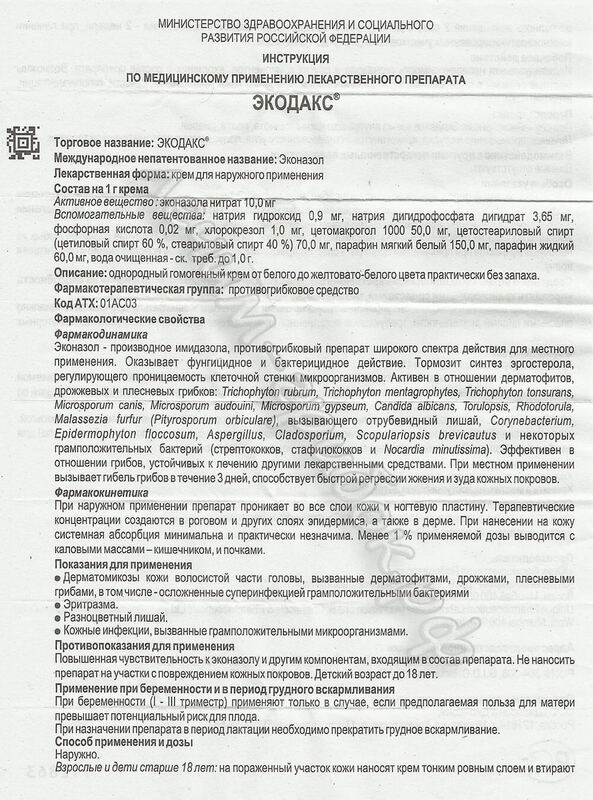 Hypersensitivity to the components of the cream. Local reactions - itching, burning, irritation, redness of the skin, rash. 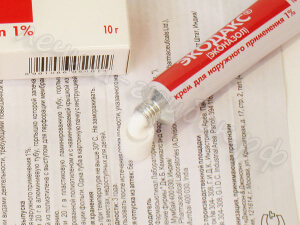 With prolonged use, hyperpigmentation and atrophic changes in the skin are possible. Be careful. If you experience side effects, you should stop treatment and consult a doctor. 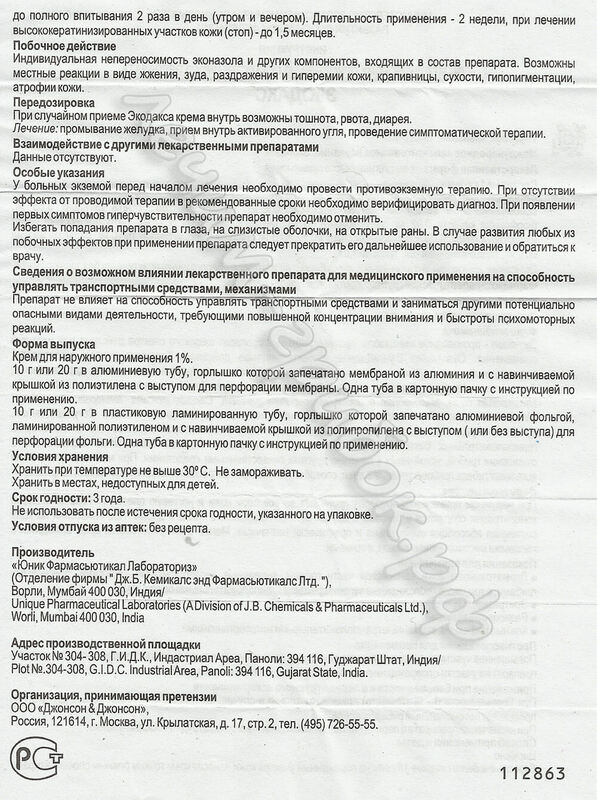 Econazole - antifungal agent of the imidazole group, a wide spectrum. Suppresses the synthesis of ergosterol, changing the permeability of the cell wall and thereby destroying the cells of the fungus. 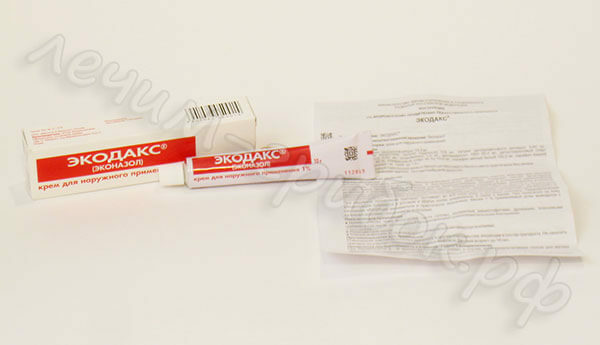 It has a strong fungicidal action against dermatophytes, yeast fungi (including Candida), mold fungi. Also works against some gram-positive bacteria. 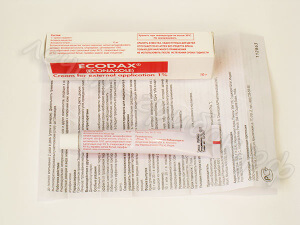 Persons suffering from eczema, before using Ecodax, need to carry out anti-eczema therapy. Avoid contact with eyes and skin. If swallowed accidentally, flush stomach. Shelf life is 3 years. 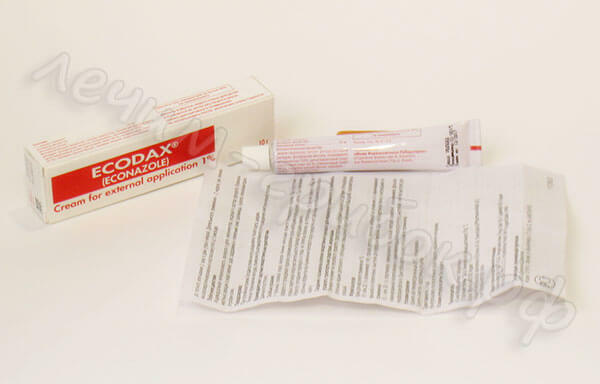 Keep out of reach of children at a temperature of 5 to 30 ° C. Sold without a prescription. If you choose medicine yourself, then from inexpensive creams it is worth trying at first more benign ones, for example Clotrimazole , which is usually also effective against the absolute majority of fungal pathogens. Itching was instant. I was even surprised. He broke out his feet in the evening and spread it, there was no itching in the morning. What happiness when there is no itch. Really helps excellent and inexpensive. Would still in drops for nails.